In Western Washington there exists an interesting anomaly. South of the State Capitol of Olympia and extending to the area known as Grand Mound, just north of Centralia, there exists a vast prairie covered in small mounds of dirt and debris known as the Mima Mounds. 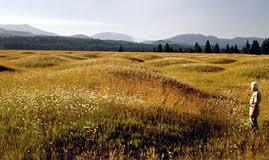 There is great controversy among scientists as to the origin of this dimpled prairie. There are about as many theories as there are theorists… including those espousing extraterrestial visitations. I have, at last found something in Thom Powell’s book, “Edges of Science”, with which I totally disagree. My disagreement was so profound and deep that I ceased reading that chapter and moved on to the next. The book, overall is too good to miss much! Our disagreement concerns his treatise on the subject broached in the first paragraph, the Mima Mounds. While I expect anyone who purchases this volume to read Thom’s discussion in total, I decided to take a bit of time here and offer a simple rebuttal. This is an area with which I am totally familiar. 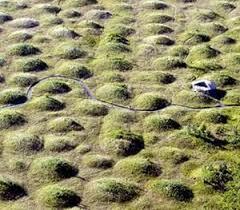 I did some of my geology work in this area and my best friend for many years lived on this golf ball dimpled prairie. I even helped him level the mounds on his ground so he could grow hay to feed his livestock, so I am familiar with the physiology of the mounds. Grand Mound is interesting in how it was formed. 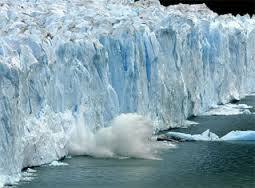 Prior to about 12,000 years ago, the earth down to about mid Washington was covered by ice. The great Wisconsian Glacier covered most of North America above latitude 47 and, in this particular area, the Vashon Lobe of that great glacier pushed down to about latitude 46.8, it’s snout acting like a giant, mile high bulldozer blade and pushing the till and rock carried on the ice up into a ridge that extended for many miles along that snout. That great ridge of debris we call today, Grand Mound… It is the southern terminus of the entire Wisconsian Glaciation. Yes, there were Alpine Glaciers further south.. the Sierra Nevada and Cascade mountains were wreathed in glacial ice, but those glaciers were not connected to the main body of ice. 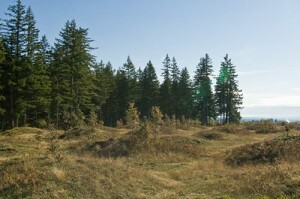 The ridge rises some four hundred feet above the prairie floor and is, today, covered with a mantle of trees. Even today it takes but little imagination to visualize the immense, mile or more thick, wall of ice butted up against ridge of glacial till that had been pushed into place by that wall. Of course, for many centuries, the snout of the glacier retreated back only to push forward again with the next cooling period. During the periods of retreat, immense volumes of meltwater ran off the pack creating virtual rivers beneath and alongside the great clumps of ice. It takes no great stretch of one’s imagination to see, as the melt back continued, gargantuan blocks of ice sitting disconnected from the main pack as it retreated even further north. Now, what I’m about to describe can be easily demonstrated by anyone so wishing more proof. When a large block of is left in the open to melt in the warmth of the day, the bottom… that part in contact with the ground, will melt with cup shaped indentations all over that surface. All one has to do to demonstrate this is to obtain a ten to twenty pound block of ice and leave it out awhile on a day that is warmer than thirty-two degrees Fahrenheit and watch what happens. The cups on the underside of a block of ice this size are, admittedly, only inches in diameter, but how large would they be on block approaching a cubic mile in size? It is commonly understood that the reason Canada has little to no topsoil except that generated in the past 10,000 or so years, is that the glaciers scrubbed it from its place in Canada and carried it south to the end of their travel. This, of course, amounted to millions of tons of debris and soil being carried on the backs of the glaciers… to be mixed in the slurry of ice and water that was the result of the actions of the ice and water and carried to the vicinity of the voids created in the base of the great blocks of degrading ice. Now, 12,000 years later, the ice has retreated to the farthermost northern climes and the dimpled prairie sits vacant, tempting people to assume their own favorite pet theories for the formation of the mounds. It has been suggested, seriously by college professors, that there once lived a race of giant gophers here that created all these hills in their search for their gopher food. Others completely believe that since trees create a small hill of duff beneath their canopy as they mature, that these were merely the result of a great, ancient forest that must have, for some reason, disappeared in the interim. A favorite among some factions is that was a landing area for ET… that somehow, vast numbers of interstellar travelers made their stop here. According to the thesis advanced by Thom Powell in his book, “Edges of Science”, there is a sizable population of resident aliens (the ET kind, not the ‘nother country types…) living underground across the world… it seems that wherever in the world these mounds are found, they are called “Mima Mounds” because they were first identified and investigated near the now non-existent town of Mima. These underground residences were, according to the author’s premise, excavated from the solid stone beneath the mantle of the earth. Of course, excavations on this scale would generate enormous amounts of waste to have to dispose of in some manner or another. It is proposed that these mounds are the great repository of the material excavated underground by the ET’s now living there. The author did not explain why these ET’s chose areas were great glaciers ended their journeys to create these fields of enigmatic dimples. Nor did he explain to my satisfaction, why the mounds are made of soil and stone dust mixed with so much organic material that the resultant soil is really quite fertile and grows seeds very well. To the contrary, I have never seen any tailing pile that contained anything other that pure mineral rock! Every underground excavation I have ever investigated consisted of only rock, not organic material in any form. These are the facts. To me it is a simple matter to determine the origin of the six to thirty foot diameter mounds, but others may not see it as I do. I don’t feel that it takes extinct populations of a gopher never found in the fossil record, nor even the efforts of ET to create this wonderfully natural area, but to each his own. From the time J Harlan Bretz (and yes, his first name was just that… “J” …), the geologist famed for having formulated the Columbia River Flood theory, first started his investigations, there have been no noticeable incidents of complete agreement so I will do as J did and leave it in the minds of the reader to reach his own conclusions.